It’s easier than you think to pipe icing hearts on top of your cupcakes! What You Need: 1 cupcake (baked and cooled); icing tinted pink; premade tube of red icing and round tip OR red icing in pastry bag with round tip such as #3. How to Make It: Frost cupcake pink. 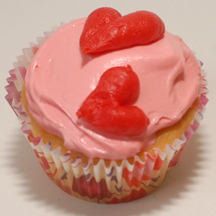 To make the left half of the heart, squeeze red icing from tip at 90 degree angle on cupcake so it forms a blob, and then (while easing up on the squeeze power), move downward and stop squeezing before you pull away. Then do the same for the right half of the heart. If your heart has too much of a “seam,” wet a small paintbrush and ease the edges together. This entry was posted on Sunday, January 20th, 2008 at 4:00 am	and is filed under Valentine's Day. You can follow any responses to this entry through the RSS 2.0 feed. Responses are currently closed, but you can trackback from your own site.